This morning brings the week’s first major economic report in the form of the Consumer Price Index (CPI)–one of the biggest inflation reports. Inflation has been an on-again, off-again market mover for the bond market over the past 10 years for a few reasons. That’s an assertion that makes old school market watchers cringe because a big part of their worldview is informed by the inflation drama of the late 70’s and early 80’s. 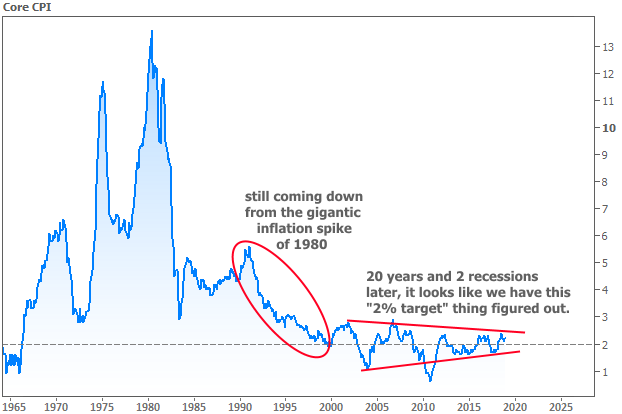 In fact, it’s only really been in the past 20 years that inflation has been relatively well-behaved (i.e. holding fairly close to the Fed’s 2% target). The runaway inflation seen in the 70’s was such a big deal for markets that any traders who remember it (and some who simply studied it) have a hard time letting go of fear that it could return. This drove some fairly panicked bond sell-offs following the Great Recession as traders feared the Fed’s policies would stoke hyperinflation. Such fears soon proved to be unfounded as inflation has simply been unable to break much above 2%. 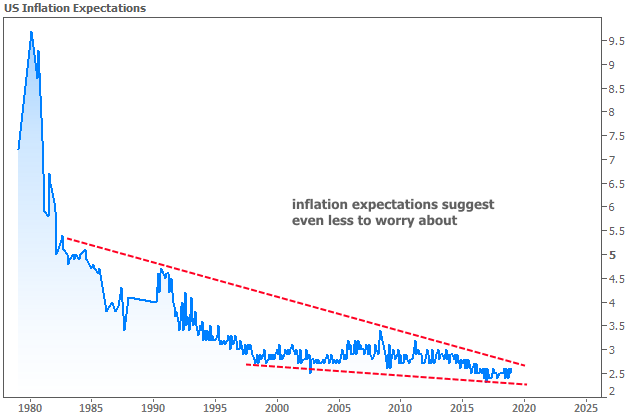 But after spending more than 15 years hovering close to 2%, traders once again began to worry about an inflation breakout as core CPI challenged 2.2% in early 2017 and again in 2018. That might have been a bigger concern by the end of 2018 had it not been for the big sell-off in stocks. Such sell-offs tend to sap inflation expectations. The following chart shows market-based inflation expectations (what traders are pricing-in) versus the S&P. Notice, however, that stocks have bounced back enough to suggest inflation expectations should be a bit higher. 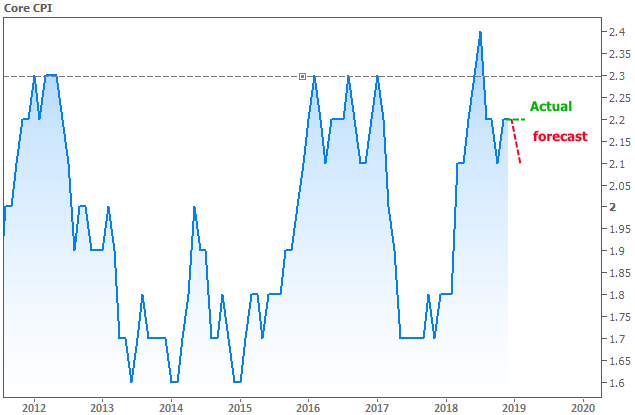 Given that this morning’s inflation data has just come in slightly higher than forecast, it stands to reason that SOME concern about the possibility of another break above 2.3% is creeping back into the market’s reaction function. In other words, because stocks are bouncing, and because there are risks on the horizon that will increase cost pressures as long as stocks aren’t tanking, the market is taking inflation data a bit more seriously at the moment. 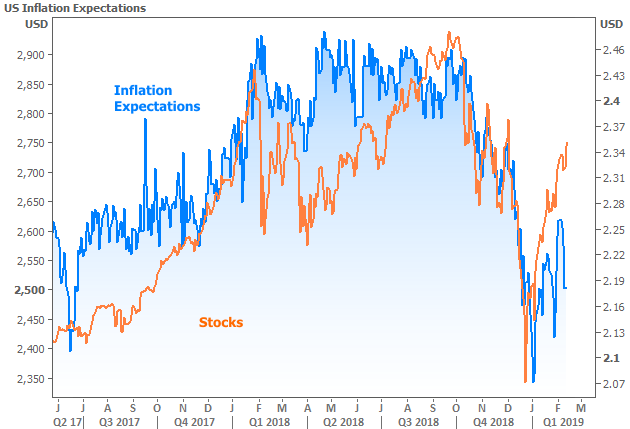 But while this may be worth a modest amount of weakness this morning, we’d need to see a bigger shift in US consumer inflation expectations (survey-based) for the market reaction to be legitimately threatening. The most recent survey data suggests we’re not quite there yet.